What is Trigger Point Pilate's? Trigger Point Pilate's is most often taught in a group environment, it combines traditional Pilate's core movements and Self Myofascial release principles. These principles are most beneficial for those seeking relief of chronic pain, those aware of muscular tightness (hyperactive muscles) and those wishing to restructure the body or improve posture. Myo means Muscle and Fascia means band. Fascia is a system of connective tissue fibres which lay just under the surface of our skin. Magnified fascia looks like a net of tubes which hold water. The role of fascia is to stabilise, enclose and separate muscles and internal organs. It's a highly active tissue full of nerves. Fascia recoils with every bump, bruise and injury, it also reacts to repetitive and functional movement. Fascia is often referred to as a "net" or "web" (similar to a cobweb) which surrounds, intertwines, protects and supports every part of the body, from bones, muscles fibres, organs, arteries, veins and nerves. Think of this net as a single net stretching from the finger tips, across the chest and from the brow to the tips of our toes. Fascia creates our form, it shapes and supports us, it also affects our breathing, posture and emotions. The researcher Dr Janet Travell, defined a Trigger Point as "A hyper irritable locus within a taut band of skeletal tissue, located in the muscular tissue." Most people refer to a Trigger Point as a knot, although no physical knot exists. These "knots" are painful spots which form in the muscle fibre or fascia. They occur when the portion of muscle fibre which contracts (Sarcomere) becomes overworked and "locked" in a shortened state, that restricts blood flow. Trigger Points form in areas of the body which are susceptible to strain due to postural or physical activities. Certain sleeping and sitting patterns where a muscle is shortened for long periods of time can also cause Trigger Point activation. These, locked shortened, knotted sarcomere need to be released! Trigger Points will often cause stiffness and weakness of the affected muscle and restrict it's range of movement, they will also be tender to palpitation. Tenderness in response to palpitation will disappear once the Trigger Point has reduced in size. Pain as a result of a Trigger Point will be deep and dull, rarely burning or tingling. Trigger Points can develop in any muscle in the body. How can we tackle Trigger Points? Massaging your muscles with foam rollers and prickle balls softens your myofascia, so that the structures within-contracted muscle fibres- can receive oxygenated blood. This technique is called Self Myofascial Release (SMR). Massaging our tissues can return them to a a lengthened flexible state and can reduce adhesion's often caused by trauma and hyperactive tissues. Practising SMR on a regular basis can result in increased circulation, reduction in pain and and improvement in range of movement. Pilate's ball (Bender Balls) and Resistance bands are also used to facilitate a supported stretch to lengthen muscles. Who will benefit from the class? 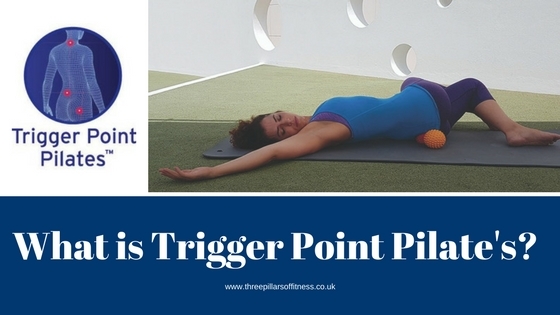 IF YOU WOULD LIKE TO KNOW MORE ABOUT TRIGGER POINT PILATES, CLICK HERE TO BOOK YOUR TRIAL SESSION.